I have to tell you, I can’t stop making these little keychains! 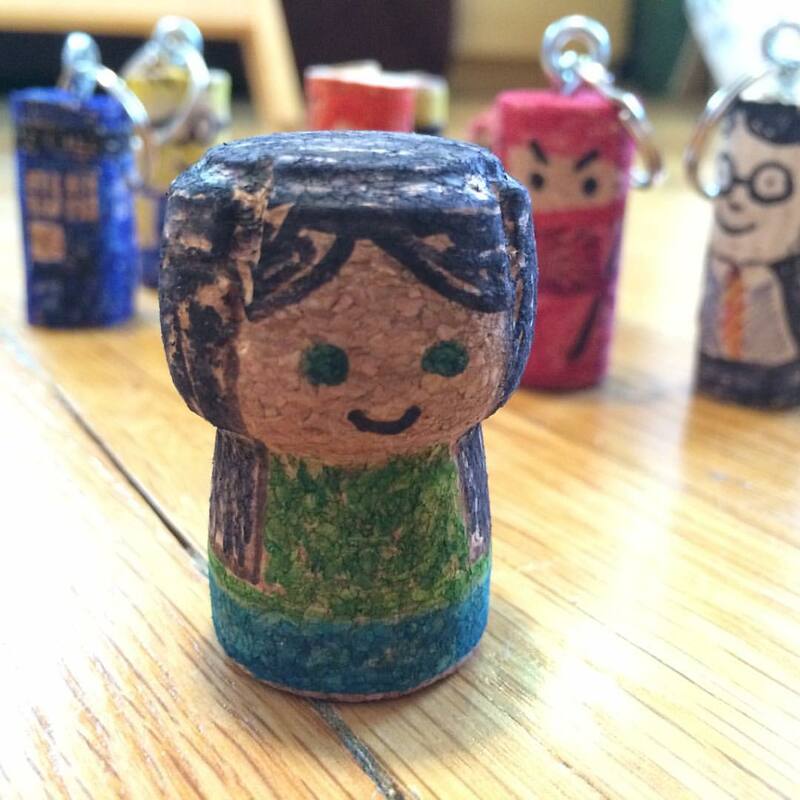 A few months ago, I had a table at the Boston Jewish Food Conference marketplace and wanted to have an easy craft made from recycled materials that would appeal to adults and kids. 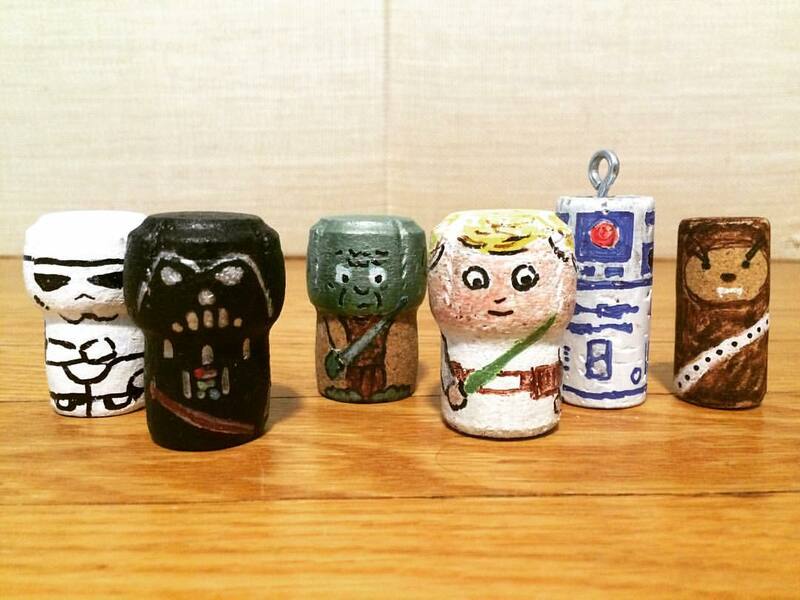 I saw some cork minions over at A Creative Princess. Minion keychains! Of course I had to try them out myself and I had a 6yo, LittleDesigner (LD), home sick with me, so he needed to try them as well. We moved from minions to Harry Potter, Star Wars, and Dr. Who and I haven’t stopped since. LD decided to teach his kindergarten class how to make them, and I wanted to share what he said with you. 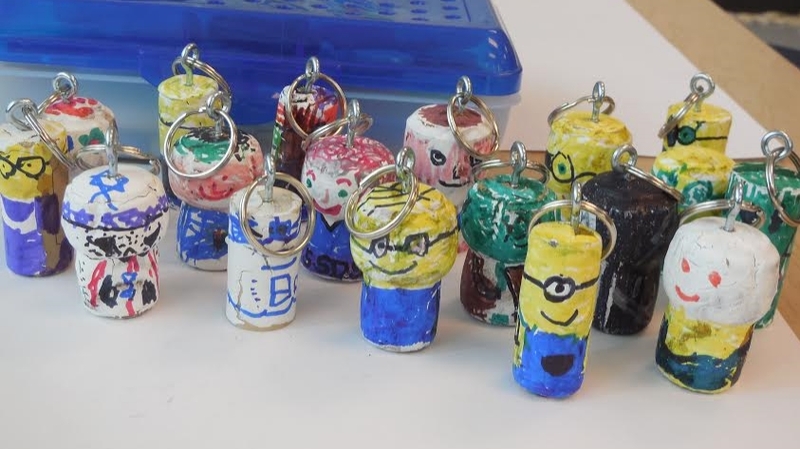 Those are the keychains that the kindergarteners made. Amazing, right?! Ok, so you want to make your own? I have a secret. Shhh… don’t tell anyone… but I didn’t drink all those bottles of wine. Whole Foods has cork recycling bins in many of their stores, and if you ask nicely, they will let you take as many from the bin as you want. Crazy, right?! So many projects to make with those corks! I used acrylic paint from Blick for the base on the corks I painted. You can draw right on the cork, but the colors are much less vibrant and you have to work around the lettering and designs already there. After much searching I found these eye screws at Home Depot, and I bought 100 Pack Keychain Rings on Amazon. The markers are a combination of Bic Metallic Permanent Markers and Sharpie Colored Markers (these are the ones that I bought, but there were a few listings, so I would check and see which are cheapest at the time of your purchase). The Bic markers went on a lot smoother, but the sharpies have a finer point. Have fun! I hope you will post photos of your finished projects.